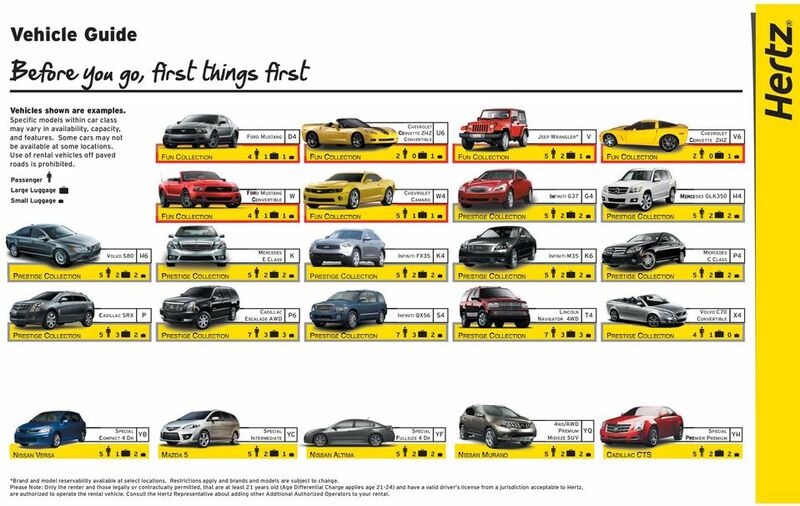 Download "Before you go, first things first"
2 Vehicle Guide Before you go, first things first Vehicles shown are examples. Specific models within car class may vary in availability, capacity, and features. Some cars may not be available at some locations. Use of rental vehicles off paved roads is prohibited. FORD MUSTANG 1 1 D CHEVROLET CORVETTE ZHZ 0 1 U6 JEEP WRANGLER* 1 V CHEVROLET CORVETTE ZHZ 0 1 V6 Passenger Large Luggage Small Luggage FORD MUSTANG W CHEVROLET CAMARO W INFINITI G37 G MERCEDES GLK30 H VOLVO S80 H6 MERCEDES E CLASS K INFINITI FX3 K INFINITI M3 K6 MERCEDES C CLASS P CADILLAC SRX P CADILLAC ESCALADE AWD P6 INFINITI QX6 S LINCOLN NAVIGATOR WD T VOLVO C70 X COMPACT DR YB INTERMEDIATE YC FULLSIZE DR YF PREMIUM YQ MIDISZE SUV PREMIER PREMIUM YH NISSAN VERSA 1 MAZDA 1 NISSAN ALTIMA NISSAN MURANO CADILLAC CTS *Brand and model reservability available at select locations. Restrictions apply and brands and models are subject to change. Please Note: Only the renter and those legally or contractually permitted, that are at least 1 years old (Age Differential Charge applies age 1-) and have a valid driver's license from a jurisdiction acceptable to Hertz, are authorized to operate the rental vehicle. 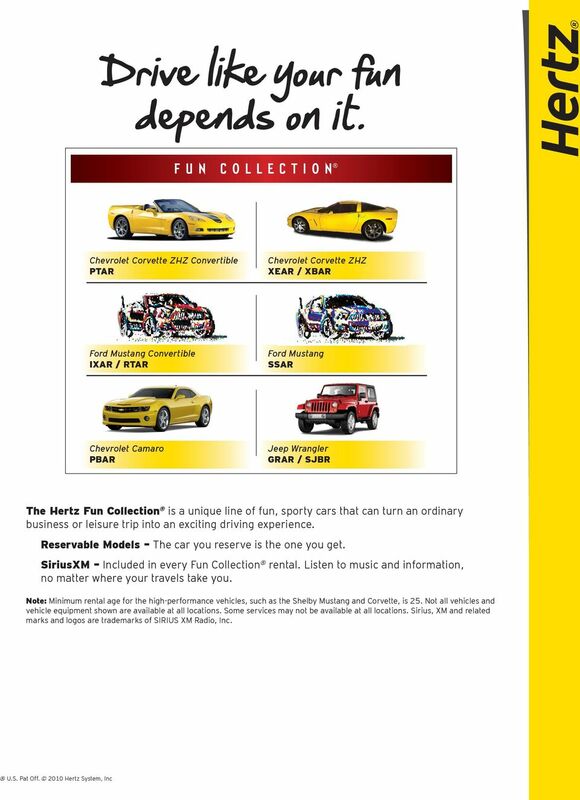 Consult the Hertz Representative about adding other Additional Authorized Operators to your rental. 4 Save Green, Go Green! Ford Fusion EXAR smart fortwo MCAR Toyota Corolla ISAR Toyota Camry FSAR Toyota Prius Hybrid ICAH / XDAR Nissan Altima / Toyota Camry Hybrid FCAH The Hertz Green Collection is a unique line of fuel-efficient cars that are both easy on the wallet and good for our environment. 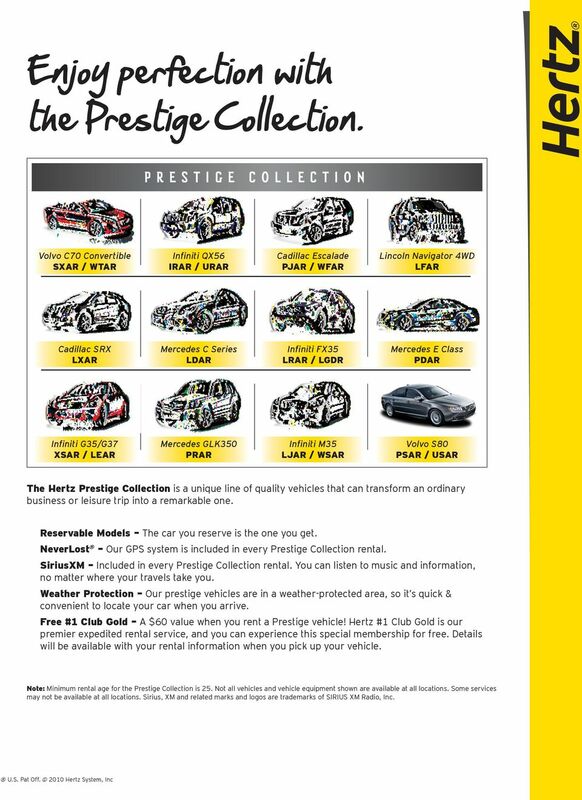 Reservable Models The car you reserve is the one you get. 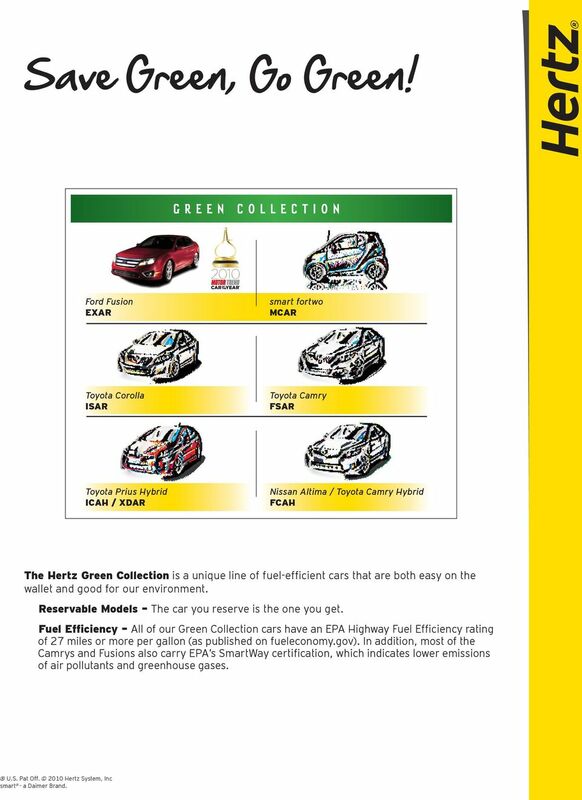 Fuel Efficiency All of our Green Collection cars have an EPA Highway Fuel Efficiency rating of 7 miles or more per gallon (as published on fueleconomy.gov). In addition, most of the Camrys and Fusions also carry EPA s SmartWay certification, which indicates lower emissions of air pollutants and greenhouse gases. U.S. Pat Off. 010 Hertz System, Inc smart - a Daimer Brand. 6 010 European Collections Hertz has a huge selection of vehicles in Europe, including convertibles, wagons and even vans, so your clients can travel in the style that s comfortable for them. XDAR XTMR LFAR LDAD L - Mercedes S R - Mercedes SLK S - Mercedes ML L - Mercedes E MBAR EDMD CDMD IDMD N - Smart Híbrido 1 B6 - Renault Clio C6 - Seat Leon Eco Style O - VW Passat Blue Motion 3 3 CBMR ITMR FTMR PTMR O - Mini Cooper U - VW Eos Q6 - Hurtan Q - BMW Z / 3 Passenger Luggage Manual Automatic All cars in the Hertz Prestige and Fun Collections have guaranteed make and model reservations, so you know the car you book is the one you ll drive. 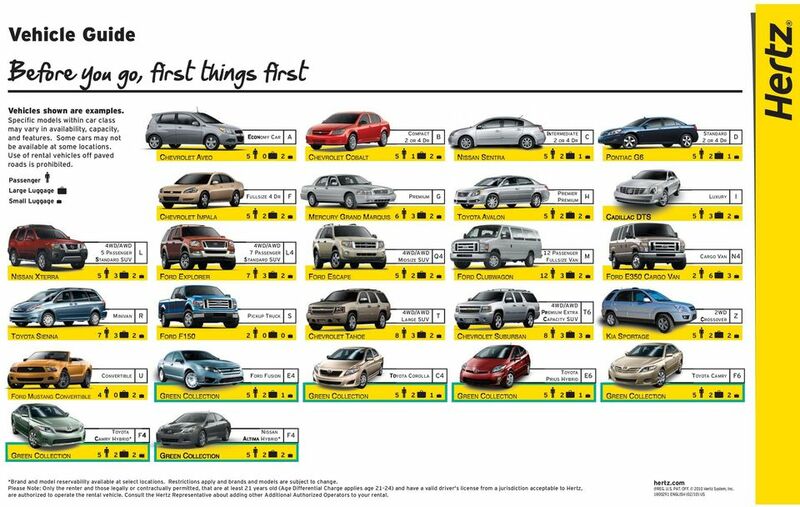 The cars in the Hertz Green Collection achieve 6 mpg, depending upon vehicle size. Vehicles shown are examples only. Specific models may vary in availability, capacity and features. Cars will be confirmed only by car group, and not by car model within a class. Luggage capacity may decrease with maximum number of passengers. Features apply to car shown. U.S. Pat Off. Hertz System, Inc.